Today I brought a card to showcase how you can achieve real winter feel on a card. I used the MFT Sketch Challenge as inspiration. I started with a piece of Bristol Smooth cardstock and die cut a mod rectangle from it. I sponged Distress Oxide inks (Faded Jeans and Salty ocean) on it and added Snowflake paste through a Snowfall stencil. I die cut some Birch trees (Lawn Fawn die) from silver cardstock. I also stamped the cute images from the You Make My Heart Spin and the You Make My Heart Melt stamp sets. I used Copics to colour them and I die cut them with the coordinating dies. Meanwhile the snowflake paste dried and I could stamp the sentiment on the bottom of the panel. I used a Pretty Pink Posh set for this and Gina K Designs Cherry Red ink. After that I assembled my scene. When everything was in place, I added Ranger Crackle Accent to the ice. It was the first time for me to use it and I was curious how it is going to look after drying. It really cracked as I expected and gave that cool icy feel. I added a bit of Spectrum Noir Shimmer pen to the scarves and skating shoes, I emphasized the eyes and noses with a black glaze pen. A little bit of glossy accent finished it off. 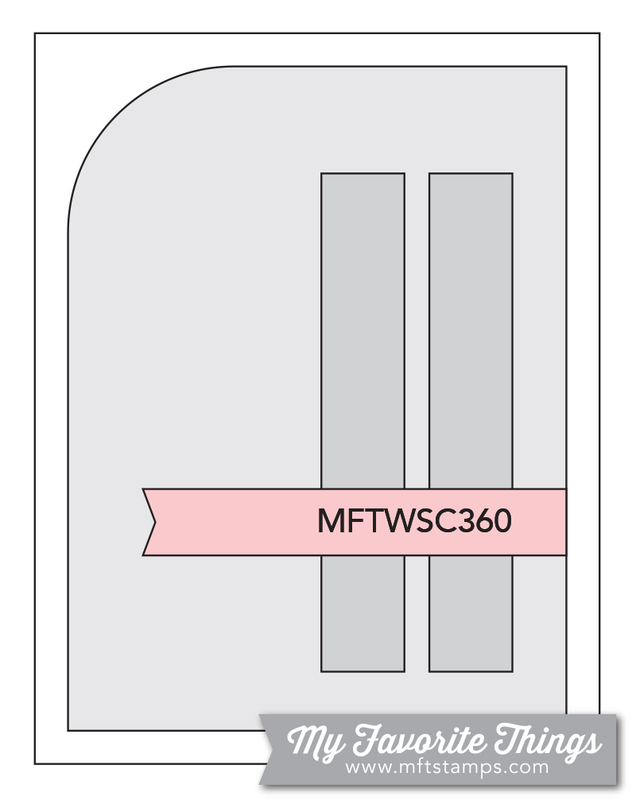 I will upload this to the MFT Sketch Challenge #360. I hope you like my card and will return soon for more fun projects. 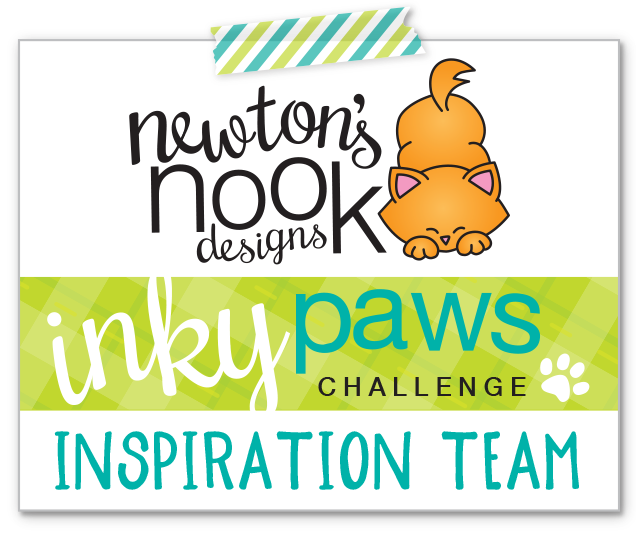 Have you played along at the Inky Paws Challenge #60 this week? It is all about glitter which is super fun! My card is a clean and simple one, I stamped and coloured the cute cat in the chimney image from the Santa Paws Newton set. I used Copic markers and cut it out with the coordinating die. I also die cut a pretty frame from dark red cardstock (Studio Katia die) and layered a brown polka dot patterned paper square on top. I cut the NND Cameo frame die from gold glitter cardstock and adhered in the middle of the patterned paper. I used 3D foam squares to pop up the coloured image. I heat embossed a sentiment from the Sentiments of the season stamp set with gold glitter embossing powder on a white top folding note card. I hope you like my card and got inspired. Come and play with us, you might win a 20 USD gift certificate to the NND online store. And by the way, they have a 20% discount still today (27/11/2017) on everything with the code: THANKS20! See you soon with another card. It is gonna be a quick post as the card I brought is very simple. I had a cute image from Your Next Stamp (Snowman family) and I just had to colour them the other day with Copics. It took a while, but I really enjoyed it. As the image is big and so cute, I wanted to keep the design simple. I added a pretty frame using a Studio Katia die which actually cuts a very thin border too. I replaced this with a silver metallic one. I did not add any sentiment, but I embellished the picture with some snow (white Flower soft poured on some Ranger Multi Matte Medium), Spectrum Noir Shimmer pen, glossy accent and some liquid applique for the snowfall. The finished card is 4 1/4 x 4 1/4. I hope you like it and will pop in again soon. Those of you who follow me here or on Instagram (safsafdesign2016) know that a few months ago I got a gift wrapped in a gorgeous glittery paper. I kept it and I am using every little piece of it. Today’s card has it too, I made a frame out of it after layering it on white cardstock. 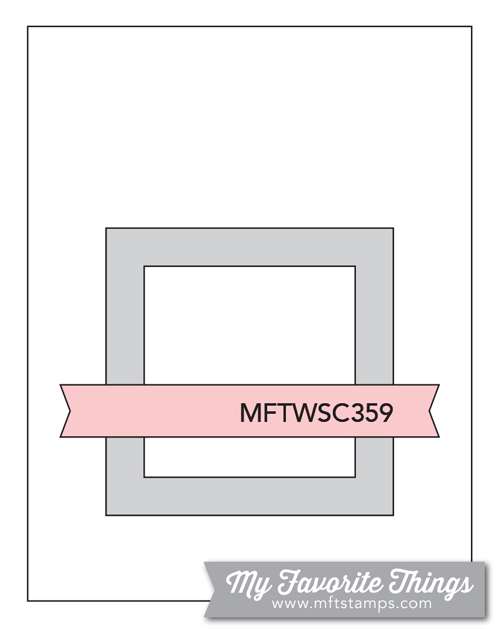 I wanted to make a card which matched the tags I made the other day – even though I used Copics to colour the cute dog from the MFT Santa Paws set this time. I used the coordinating dies to cut it out. I used an Echo Park stencil and white embossing paste on a white card base for a tone on tone textured background. I used a simple post it note to mask off the space for my frame as I wanted a clean background for my image. I also used the MFT Stitched strip die to give a bit of stitching detail to a piece of kraft cardstock and heat embossed a sentiment in white on a thin strip of dark brown banner. After assembling the card I used a bit of Spectrum Noir shimmer pen on the Santa hat, jingle bell and the stripes of the sock. A little bit of glossy accent on the nose and bell and black glaze pen on the eyes made the image even cuter. This card I made for the MFT Sketch Challenge #359, but will upload it to the SSS Wednesday Challenge Furry friends too. I hope you like my card and will pop in again soon. Today is the start of the new Inky Paws Challenge #60 and it is all about sparkle. I wanted to make a very dimensional scene, therefore I cut several Scalloped stitched rectangle frames from Pretty Pink Posh. I love to recycle packaging materials, like the backing of the stamp and die sets when building a dimensional frame. Noone will ever see and it is thicker a bit than any of the cardstock I have. The last layer is cut from silver glitter paper. Before adhering the background scene, I also die cut some Lawn Fawn Birch trees and 2 stitched hillside borders from white cardstock. I also heat embossed in white the snowfall background stamp from MFT on vellum. I cut a blue rectangle as a background and built my layers. My “sandwich” is: blue background, 3 birch trees, 2 frames stacked, vellum, snowbank, birch trees again, frame, snowbank, frame, glitter frame. I get a lot of dimension this way without using foam tape. The images are from the adorable Santa Paws Newton set, coloured with copics and die cut with the coordinating dies. I also stamped the sentiment from the Snow globe scenes with Versamark and white heat embossed it on a piece of dark red cardstock. I adhered my shadow box style scene on a piece of metallic dark red cardstock and this went on a white A2 sized card base. A bit of my usual finishing touches I could not leave out: Spectrum Noir shimmer pen on the snowbanks and the Santa costume, some glossy accent on the belt and noses and the pole. I hope you like my card and got inspired. You have 2 weeks to create a project with some sparkle and link it up on the IPC website. You might be the random winner of the 20USD gift certificate to the NND online store! I will link this up on the Simon Says Stamp Monday Challenge Its a stitch up and on the SSS Wednesday Challenge Furry friends, where they are featuring Newton’s Nook Designs this week. See you soon with another cute holiday card. Then I added a Hungarian sentiment on the back stamped with Altenew Parrot ink. Such a beautiful green shade! I added a strip of glitter wrapping paper to the bottom and a stitched strip of dark brown cardstock. I also die cut the reinforcers from metallic brown and the glitter wrapping paper and glued them on the front and back of the tags. As a finishing touch, I added a bit of Spectrum Noir shimmer pen to the collar and the Santa hat and a bit of glossy accent on the nose and jingle bell. A little gold string finished it off. I will upload this project to several challenges: SSS Monday Challenge It’s a Stitch up, SSS Wednesday Challenge Furry friends and also to the MFT Blueprints Construction Challenge Holiday tags. I hope you like my tags and will return soon. I will try to post more often, there is a lot to share and time is flying. It is Monday and time for a new Inky Paws Challenge #59 inspiration. The colours are gorgeous, so cozy for me. That gave me the thought to make a cozy inside scene which we see through a window. I started with die cutting the MFT window die in the middle of a white heavy weight card base. After that I took an MFT brick stencil and sponged some brown shades of distress inks. I die cut the window frame twice from dark brown cardstock and a piece of acetate to go in between. I also die cut a sentiment from red foil cardstock (DCWV). After assembling the outside of the card, I stamped the cute image from the Newton’s Nook Designs Fireside friends in the inside. I coloured it with Prismacolor Pencils. When it was all coloured I added Spectrum Noir shimmer pen on the fire and the bow and a little glossy accent to make the image even more special. I hope you got inspired and will return soon for more holiday fun. You can play along the IPC 59 until this Friday so hurry! You may be the lucky winner of the 20 USD gift certificate to the NND online store.